Just a quick reminder to everyone that our submission period for issue 02 will be closing at the end of the day Saturday, January 31st. We plan on having a small hiatus while make decisions about the final contributors and we prepare for our trip to the AWP Conference in Chicago this February. 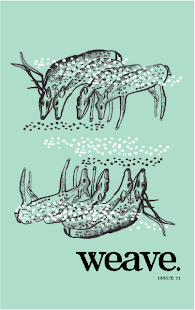 We hope that if you are going to the AWP that you'll stop by our book fair table to meet the Weave editors and to pick up a copy of issue 01 in person. We are please to announce that we will have Pittsburgh's own Michelle Stoner available at noon on Saturday, February 14 at Weave's table to sign copies of her book Flats and Riots. We also plan on having some neat swag to give away along with a raffle for some writing essentials. We also want to say good luck to the Pittsburgh Steelers this Sunday at the Superbowl! Let's get one for the other thumb guys! Modern Formations 4919 Penn Ave.
Typewriter Girls & more poetry this week! 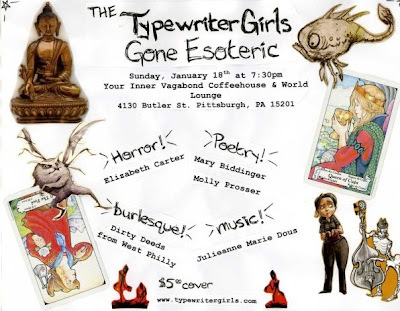 Some of you may know we have a lot of connections with Pittsburgh's only Poetry Cabaret, The Typewriter Girls. They have a fantastic show this Sunday night at Your Inner Vagabond. Doors Open at 7:30 Show Starts at 8:00! $5.00 cover includes tarot card reading, palm reading, cheap whiskey - and of course poetry, dancing and merriment! We certainly hope everyone's holiday season was happy and safe this year. Weave is looking forward to the new year ahead, but also thankful of the year of our fruition. We have certainly been through many things this past year. We are still so humbled by the approval of our grant from The Sprout Fund this past fall. Our release party was so very successful. We have really grown and and felt welcome by our local community. We had an overwhelming acceptance and support from the literary community. Our online presence grows each day. Our website continues to be more and more visible and we have continued sales of issue one, despite the trying times on the economy. We ran two successful writing workshops. We have received a lot of positive feedback on the first issue. Looking back on 2008, we feel very honored - and excited for things to come! In 2009, you can expect to see more great things from Weave. This Saturday, Weave's co-editors spoke on a panel to Carlow University's MFA students regarding publishing. In February, we will be attending the AWP Conference in Chicago. We plan to run another writing workshop this winter. We will be planning an issue 02 release party for the spring (we are currently still open for submissions for the second issue). We hope to collaborate again with Open Thread on the Poetsburgh reading series. We will continue to promote literary events in Pittsburgh, write engaging reviews of emerging and established writers, and keep you updated on all things Weave here on our blog. There are so many exciting things ahead and we can't wait to share them all with you.